Direct and lead the development of long and short-term plans of Teacher Education and TVET ih tandem with the Ministry’s Strategic Plan. Plan and prepare programmes on human and capital development in Teacher Education and TVET. Principal Activities of the Ministry are to produce competent high level manpower through an effective quality higher and tertiary education and training system whose products are agents of development, social transformation and competitiveness in Zimbabwe and abroad. The Department of Technical and Vocational Education formulates and disseminates policies that influence the establishment of an efficient national TVET System. It establishes major activities of institutions and consults stakeholders to meet national goals. It conducts surveys and skills audits in order to advise institutions on the country´s manpower needs. 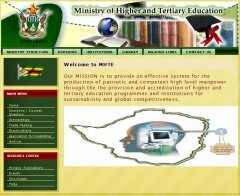 It is responsible for maintaining a responsive information system on TVET programmes implemented by the ministry. The TVET Dept assists TVET institutions in designing and maintaining local infromation systems for their purposes, head office and stakeholders such as industry and commerce. The Dept also evaluates and determines the impact of TVET policies and programmes in relation to industry and commerce.